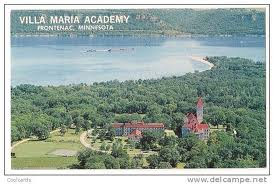 The Troutbirders had visited Frontenac State Park and also Villa Maria, Mrs. T’s childhood Catholic boarding school. That was the place where the nuns had taught her to love God and despise liver and onions as well as splitpea soup (two of my favorites). Come on along and take a look…..
We saw the usually ubiquitous honkers and more that a few ducks but the tundra swans had not arrived yet in their tens of thousands. 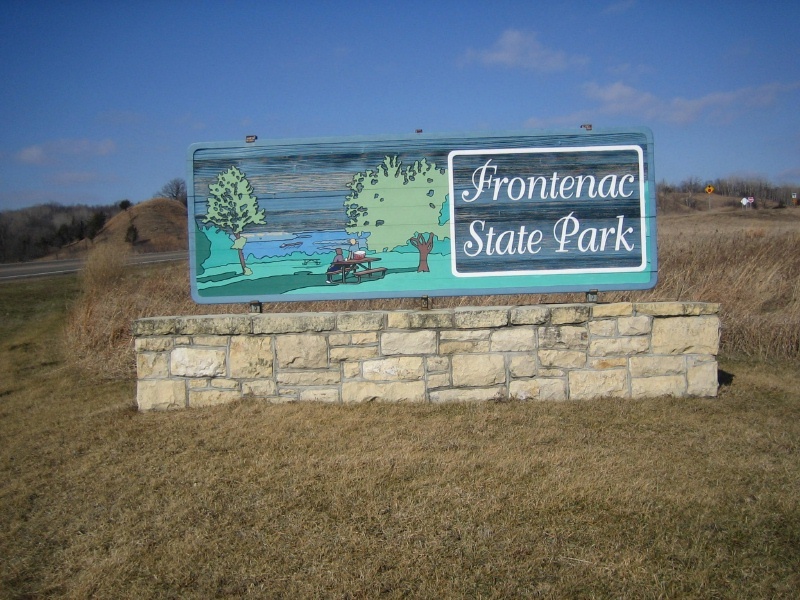 Frontenac State Park lies on the bluffs, high above the Big River. 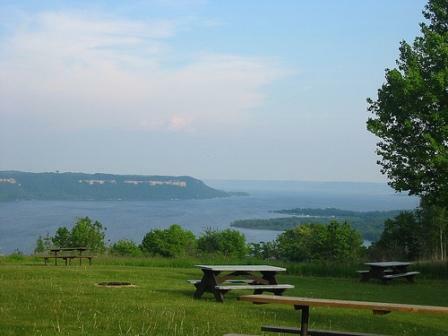 Every stop along roads and trails there yields wonderful views. 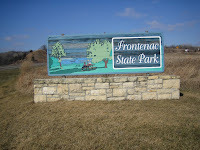 Strangely we have never camped here before so we added it to our "bucket list." 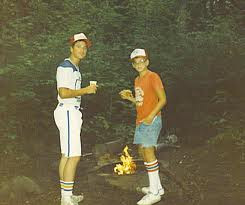 My own experience at Frontenac was at a summer Methodist Youth Camp right on the river. Think swimming, volleyball, campfires etc. It was lots of fun and part of growing up. 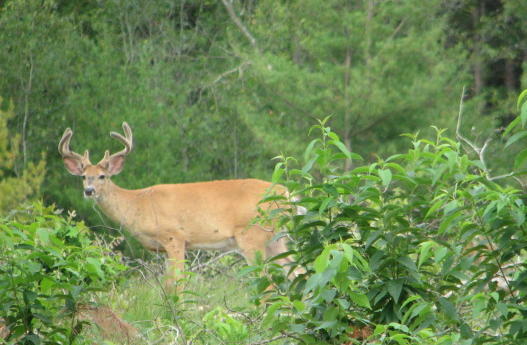 I might see a Great Horned in the woods while I'm hiking with Baron, though I never see them before they fly off though and disappear quickly through the trees. 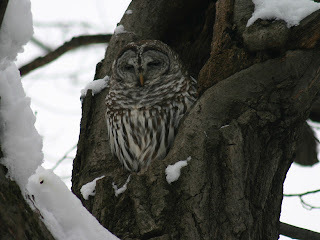 Again rarely, I might hear a Barred Owl calling at night in my woods. "Who cooks for me? Who cooks for me?" That's it. They’re just a distant call in the night. Now, the highly respected DNR (Department of Natural Resources) has apparently made it even more difficult. 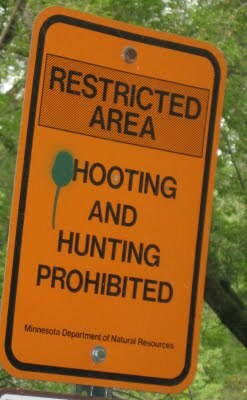 I came upon this sign last summer while trout fishing in Beaver Creek State Park. So now the owls aren't allowed to hoot and photographers can't shoot in our local state parks? Mmmm. Or maybe I missed something here? "...no doubt the universe is unfolding as it should. Therefore be at peace with God, whatever you conceive Him to be. And whatever your labors and aspirations, in the noisy confusion of life, keep peace in your soul. With all its sham, drudgery, and broken dreams, it is still a beautiful world. Be cheerful. Strive to be happy." me III (Defender of the Realm) has been completed by another writer following Manchester’s death in 2004. I just finished that one and reviewed it on Troutbirder II. pertise," they and others like them, brought history to the forefront of American literature. 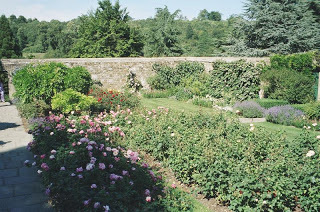 Here Churchill is standing, somewhat begrimed, in the garden of his modest estate Chartwell. These are the wilderness years. Few are listening to his urgent warnings about the danger posed to Great Britain by Hitler and the Nazis. Manchester succeeds in page after page of intimate details to bring this great and eccentric man to life. Shovel by shovel, brick by brick he builds garden walls and ponders the saving of Western Civilization. Not being in a position to accomplish the second, I thought I could at least try to build the first. "It would be impossible to find somebody writing narrative popular biographies that doesn't have a debt to William Manchester," said biographer Douglas Brinkley. 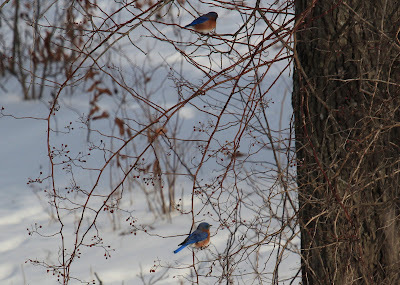 "He understood that there's nothing wrong with writing history as being a page-turner,"
I’ve had some unusual (for southeastern Minnesota) visitors at our backyard feeders the last few days. 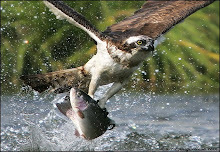 Yes, we birders get really excited when the out of the ordinary shows up. Especially in winter. 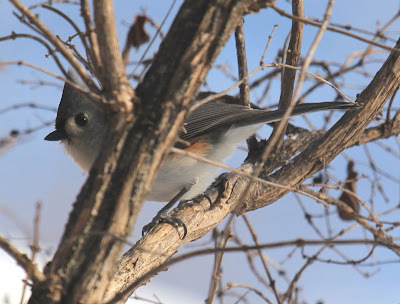 We’ve had titmice, which are north of their usual range, a few times before. The collared dove is a “lifer” for me, so all in all it was an exciting day to see them. 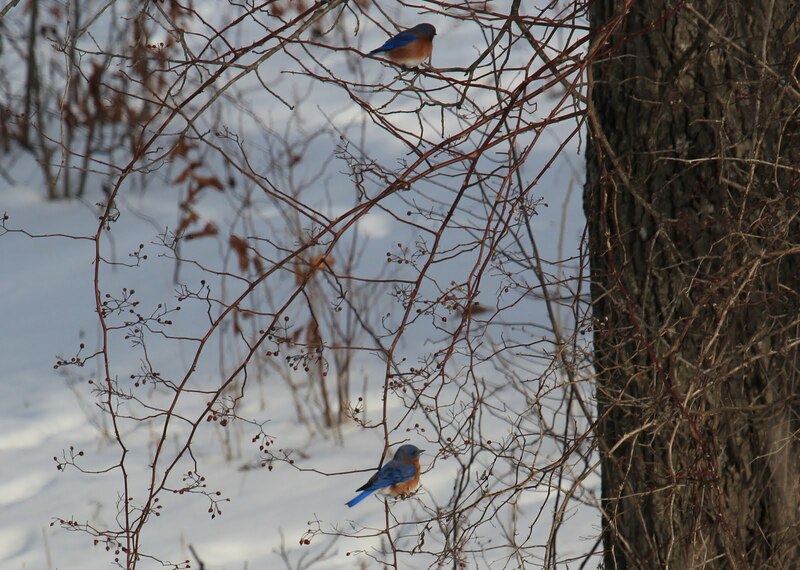 On top of all that my friends Mr. Science and his wife Bobbi spotted some overwintering bluebirds recently in nearby northeastern Iowa. Another fairly rare birding event in these parts. Guess where me and Mrs. T will be heading next week….. 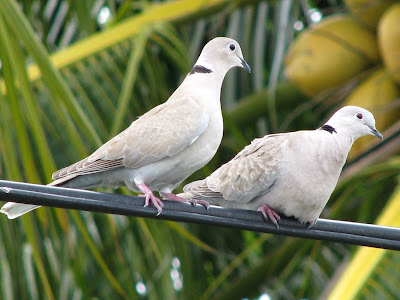 The alien collared doves have spread very rapidly from Florida , northwest, all the way to Alaska according to Cornell University. Amazingly, they do not seem to be having a detrimental effect on native doves . Dove Picture from Cornell Ornithology Lab. recently to obtain a photo of my great grandparents. 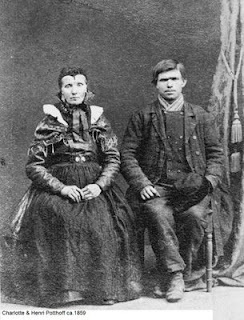 It was taken in 1859, the year they were married in Germany. They had four children, three boys and a girl. All emigrated to the United States in 1880 and 1881. Henri was a Lutheran minister. He died in route and was buried at sea. My grandfather, Charles (Karl), had left Germany first along with several cousins and began working for a railroad in Chicago. My great grandmother and the other siblings eventually made it to rural Woodbury Minnesota, now a large eastern suburb of the Twin Cities, where they established a farm. Later my grandfather moved to St. Paul where he raised his family of six children. They lived about 10 miles from his mother and siblings farm. Here is the farm. I magnify the picture closer and closer. Horses, cattle, a dog, chickens, geese, farm implements, sheds and a house, partially hidden behind some trees, emerge. You can see some people. It appears there are both children and adults. I can't see their faces though. Nor know their individual stories. The year is 1908. One year before my father was born. The people are, no doubt, his Uncle, Aunts and cousins. They call it genealogy. It is a subject of which I am quite ignorant. 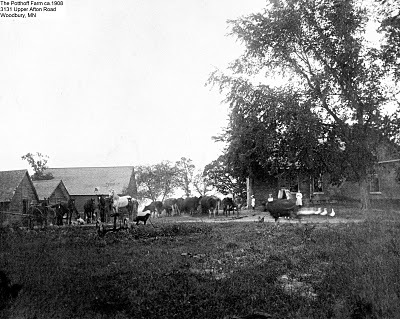 Woodbury in 1908 was a small rural crossroads east of St. Paul. Now it’s suburbia, with attendant housing developments and shopping malls. There my great grandmother established a farmstead on 160 acres with the help of several of her sons and a daughter. They had left the German city of Bremen aboard the ship, General Werder. On that voyage my great grandfather (who was a Lutheran minister) developed pneumonia, died and was buried at sea. 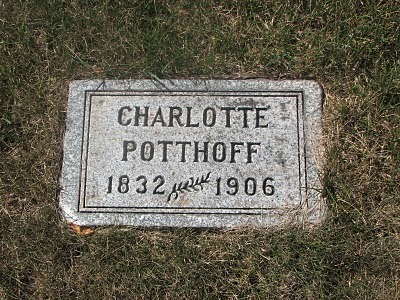 Charlotte (my great grandmother) and three of her children arrived at Castle Garden, Manhattan, New York on September 29, 1881. It's a long and complicated story of which I know only bits and pieces. My grandfather, another of Charlotte’s sons, had arrived in Chicago a year earlier. There he was working for a railroad. 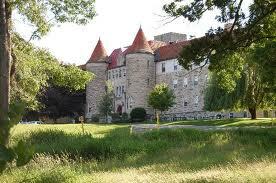 He later moved to St. Paul, where he was employed as a railroad chef on transcontinental routes. There are large gaps in his story, which I would like to learn. I began by visiting a Methodist cemetery in Woodbury. This was the home church of his mother. Hopefully, there is more to be learned. "Man was made for broad scenes and tall shadows. He craves a noble background. Cramp him and he revolves in an ever narrowing circle, until he finally doubts his own destiny. The song goes out of his heart." 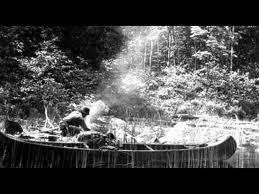 Ernest Oberholtzer: Unsung Hero of the BWCAW Ernest Carl Oberholtzer (February 6, 1884 – June 6, 1977) was an American explorer, author and conservationist. 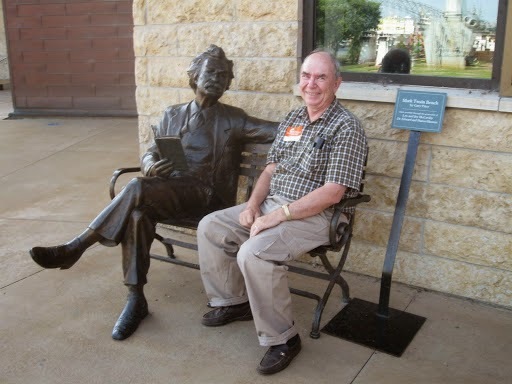 Nicknamed "Ober", he was born and raised in Davenport, Iowa, but he lived most of his adult life in Minnesota. Oberholtzer attended Harvard University and received a Bachelor of Arts degree, but left after one year of graduate study in landscape architecture. 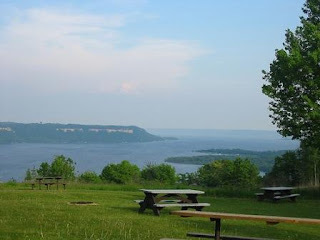 He made his first trip to the Minnesota-Ontario border lakes in 1906. In 1909 he took his first extended canoe voyage through the border lakes and the Rainy Lake watershed, traveling 3,000 miles that summer. During the period from 1908 to 1915, Oberholtzer wrote a number of articles and short stories, some under the penname Ernest Carliowa. 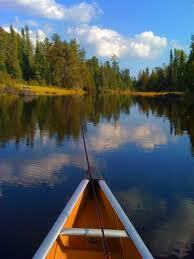 Many of the stories and articles were based on his canoe trip experiences. In 1913, Oberholtzer moved to Rainy Lake. He purchased Mallard Island in 1922; the tiny island would be his home for more than 50 years. After plans were announced by business mogul Edward Backus to construct a series of dams to harness the Rainy Lake watershed for power generation, Oberholtzer spoke in opposition at a hearing of the International Joint Commission held at International Falls in September 1925. As a result of meetings with Minneapolis businessmen who were similarly opposed to industrialization of the area, the Quetico-Superior Council was formed in 1928. Oberholtzer served as its first president. His activities for the council included lobbying United States Congress and the Minnesota legislature, testifying before the International Joint Commission and building public support for the council's program. In 1934, President Franklin D. Roosevelt created the President's Quetico-Superior Committee to advise and coordinate government activity concerning the Quetico-Superior area. Oberholtzer was its first chairman, and served as a member until 1968. Oberholtzer was one of the eight founding members of The Wilderness Society and served on its executive council from 1937 until 1967. His addition to The Wilderness Society lent national stature to the group. In addition to his wilderness campaigning, he spoke fluent Ojibwe and was a fervent student of their culture. He never married and died in 1977 after a long period of ill health. Oberholtzer is recognized today as a leading advocate for the preservation of the Quetico-Superior lake area, as well as an advocate of the Native American culture in that region. The Minneapolis Star Tribune selected Oberholtzer as one of the 100 Most Influential Minnesotans of the 20th century. 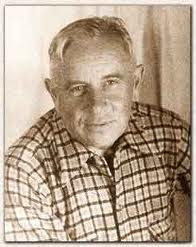 Ernest Oberholtzer spearheaded the early battles to preserve the Quetico-Superior wilderness, and at the time of this letter was building support for his plan to create an international treaty that not only would protect what we know today as the Boundary Waters Canoe Area Wilderness and Quetico Provincial Park, but would zone the entire surrounding Rainy Lake watershed. The photo upload icon is not appearing for some users on Internet Explorer. We're investigating the issue and will update this post as soon as we have more information. This from "help" . I wonder if I should hold my breath..... grrrrrr? I haven't been able to download a picture here for several days. Any idea what to do????? I tottered off to bed last night exhausted from a long and mostly disheartening trip to Arizona. Darkness settled all around me till I heard the soft call of Barred Owl around ten o'clock. "For sounds in winter nights, and often in winter days, I heard the forlorn but melodious note of a hooting owl indefinitely far; such a sound as the frozen earth would yield if struck with a suitable plectrum, the very lingua vernacular of Walden Wood, and quite familiar to me at last, though I never saw the bird while it was making it. "[Henry David Thoreau (1817-1862), American philosopher, author, and naturalist. When I reawaked this morning I remembered that call and wondered what the message had been. Looking out the window into the backyard I knew. Friend owl had been announcing the coming of a winter storm overnight. Each season has its own rhythms. For me winter is the time of repose. 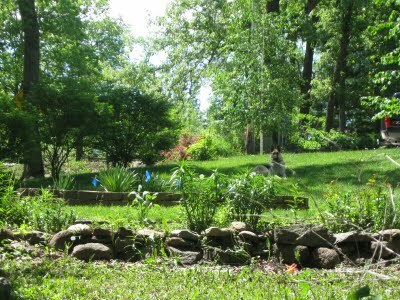 I set aside the energies of the outdoor life and enjoy nature from a warmer view. I watch and read from my recliner chair now enhanced with a gracious Christmas gift a Nook, covered by a warm blanket, and with a stack of books waiting their turn. Of course, there are some outdoor duties. The sidewalk has to be shoveled, the driveway plowed and Mr. Baron taken for his walk. 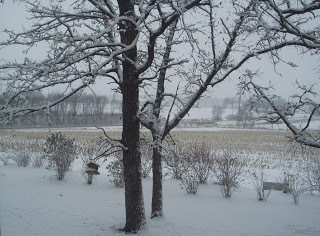 Thoughts of gardening, birding, fishing, photography, hiking and camping will lay dormant till cabin fever sets in (usually about February 1st)! 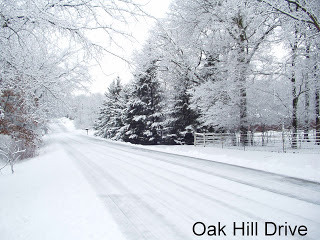 It's 9.00 a.m. and the road is plowed already. People have to get to work. Not me though. I trudge back into the house to look for my reading glasses. There is something to be said for being retired. The driveway can wait.